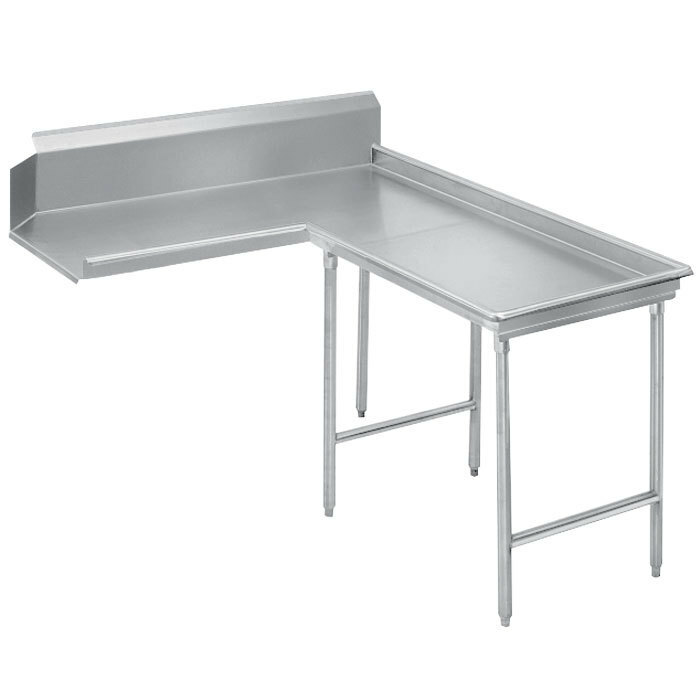 Use this Advance Tabco DTC-G70-48 4' standard stainless steel "Island Clean" dishtable to hold clean racks of dishes when they come out of your dish machine and improve efficiency in your establishment! This L-shaped dishtable boasts a durable 16 gauge type 304 stainless steel top sure to withstand the rigors of constant use, and to protect your walls it features a 10 1/2" backsplash on one side with a 2" return. 1 5/8" diameter stainless steel legs with welded cross bracing and adjustable stainless steel bullet feet provide support for the whole table, and its stainless steel gussets are welded to a support channel for added reliability. Additionally, all welded areas are blended to match adjacent surfaces for a sleek and clean appearance.